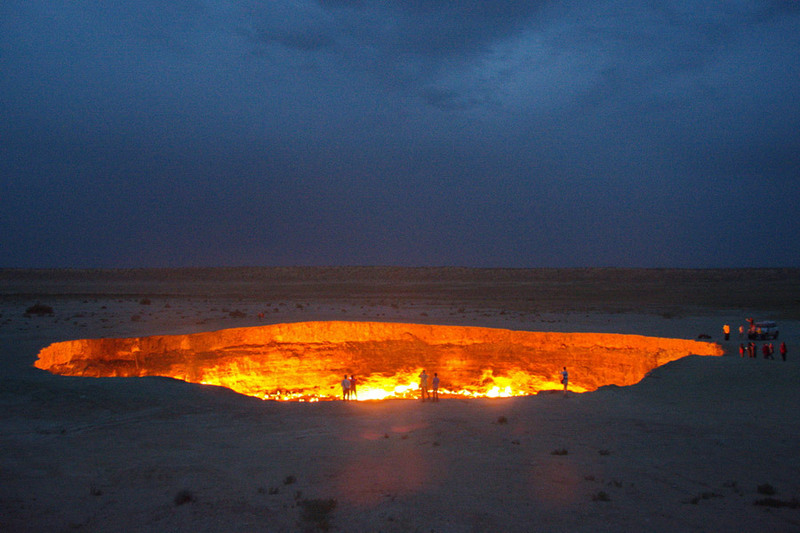 This entry was posted in Environment, History, Nature, Our World, Politics, Science and tagged Darvaza Crater, Derweze, Gate to Hell, Portal to Hell, Turkmenistan. Bookmark the permalink. Gateway to hell indeed. I wonder what would happen if one of those tourists fell in there? Asphyxiate first, then burn up? Great idea, to set a natural gas bubble on fire! Trust your scientists, they say; trust your authorities, they say. Yeah, right. Doesn’t sound like scientists had anything to do with that decision. Stunning. It jogged my memory of the as-yet-unexplained holes opening up across Siberia, and why they aren’t a bigger story. And John, this is what you’re talking about, I think. Cool. I’ve heard leaking methane is probably the cause… and if that’s the case then is not good news for our planet. The bones of the Earth breaking open, Ark? It is a Sci Fi novel I recommended for John a year or two ago and it turned out to be one of his favorites. I won’t drop any spoilers. He raves about t now and has read almost everything the author wrote. I’ve ordered the book, thanks Ark. I should get referral commission from Robert Reed! I hope you enjoy it as much as John and I. Is this the book you refer to: https://www.goodreads.com/book/show/100208.Marrow by Robert Reed? Some really good comments on that book. I must have read it a half dozen times. Ok, now I have to read it too. Off to Amazon…. Spin-outs: a-holes have to be a-holes, it’s their nature, and the “pickup” truck industry is only too glad to furnish them with the toys for noise and pollution. Global News just said 20-25 cm overnight. Tomorrow morning should be a hoot – terrified greenhorns behind the wheel of $75,000 Range Rovers paralyzed with fear, braking hard instead of gearing down, oblivious to taking a run at hills and utterly void of realization their vehicle would soldier on if only they knew how to drive. Sigh. Fender-benders and another excuse for ICBC to hike up insurance rates. The Waywards are coming up!!!!!!!! Sha’ Tara has just ordered the book … don’t spoil it! As I said, I should get referral commission from Reed. S’okay … wouldn’t dream of imposing. You can tell him how much I loved the book if you like? After I read the book, maybe I’ll suggest something on his blog (web page), huh? Great post. As the old saying goes, you learn something new every day.